Summer in Portland is such a mixed bag. While we've had some periods of nasty hot weather, this year has been generally pleasant. We've been lucky to have mornings that are often cool and overcast...which allows time to get out and enjoy the garden (and accomplish the odd chores) before the sun emerges to send me scurrying for cover. ...which is this! I take full (well almost full) responsibility for this state of affairs. The north slope (where they are planted) is in full shade until about June...so the plants grow tall and lush...then flop under their own weight. Plus, the onset of hot, dry summer weather coincides precisely with the time that they start to get almost full sun...and the stress seems to trigger powdery mildew. This happens like clockwork. Every. Single. Year. I put up with it for a few years...and, to be honest, I can put up with a lot from plants. While it's not my favorite activity, I've accepted that my not-so-ideal light conditions means that I'll have to stake the occasional plant. However, flopping and succumbing to disease are two strikes...and since I don't like spraying plants constantly, I decided a few weeks ago to enjoy the blooms for now, but they would be coming out this year. In the background, you can see the plants that were waiting in the wings to take their places. Surprise, it's a grass! HAHAHAHA! Panicum 'Shenandoah', one of my long-time faves. While on a recent shopping trip with Heather, we stumbled on these at Means...large plants for only $7.99! I bought one, just because I couldn't resist...but in the back of my mind, I was already thinking I'd come back and buy more...for this very spot! I already love them here...they just seem so "right" for the spot. They are actually planted adjacent to an existing patch of the same grass. For the past few years, I'd sort of wished I'd planted a bigger, more generous swathe of these beauties...so this proved to be the perfect opportunity to do just that. As lovely as the patch of Panicum was in the past, their effectiveness increases exponentially the more you add to their numbers. Their vertical, linear form contrasts so wonderfully with the softer, rounded forms of the plants around them...and their season of interest is so much longer, practically year-round beauty with absolutely no effort on my part...how can you not love that! ...oops, too late...already found something...this variegated Willow...I've decided to remove it this fall and replace it with...well, I'm not sure yet. I'm planning on enlarging the patch of Panicum that is adjacent to it ('Cheyenne Sky'), but other than that, haven't quite figured out what to do...any suggestions? Very nice, since I love ornamental grasses I approve of course. It's amazing how seemingly small changes can make such a difference. 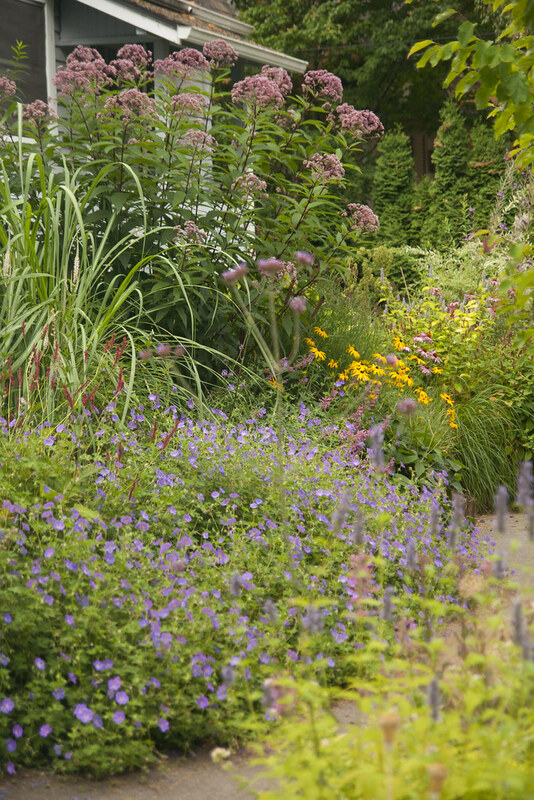 The salvia looked good there even though it flopped over. It seems I move a few every fall for the same reason. The grasses will behave better though. It's editing Scott. Just think of it as professional editing. It makes the compost bin that much easier to approach for me. 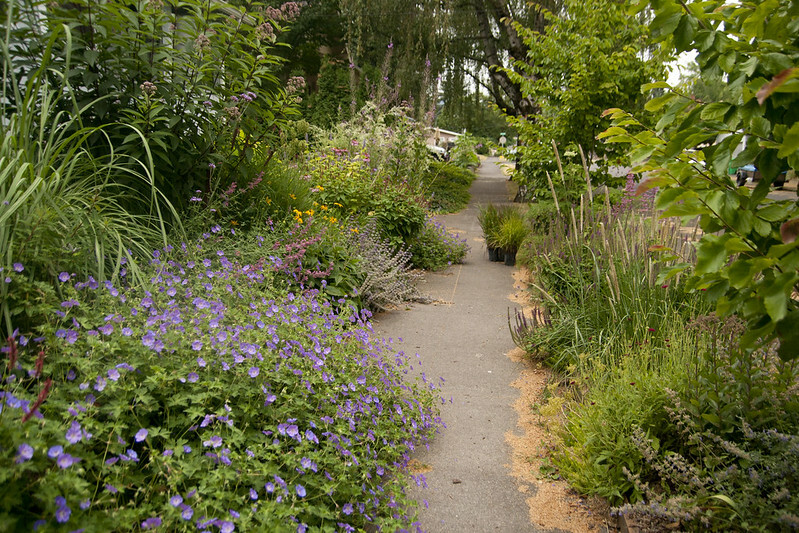 That spot being vacated by the dappled willow is perfect for you to try some Penstemons. You really need some. I love the larger swath of Panicum. OOOOO...I love that Idea, Alison! I've been lusting after the deep purplish-red ones I've been seeing at nurseries lately! I suppose Portland doesn't get heavy downpours in summer? 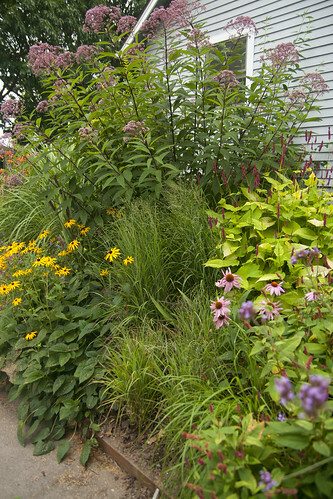 I always get jealous when I see photos of summer gardens full of upright (mostly) plants -- especially grasses -- and then see my flattened beds (or single plants). It's true, Alan...actually, we don't get ANY rain from the end of June until almost October...which is a mixed blessing. It's nice to not have storm damage from heavy rains...but we HAVE to water during summer...3 months with no rain is crazy! What a difference that change makes! Being the sloth that I am, I'd have left the salvia and complained about it every year. Good for you! You're so funny: "Surprise! It's a grass!" I like the way that Panicum texturizes the sidewalk a lot! Can't wait to see what you do with all that space from the willow's removal...I'm guessing a grass or two will figure prominently! Hahahahaha...I hate to be predictable...but I guess we like what we like, rigtht ;-) HAHA! I think you guess correctly! You have hit upon the perfect solution to running out of room: banish the underperformers. A grass that I love and haven't noticed in your garden is Panicum 'Heavy Metal'. It is a lovely deep, metallic blue, stands perfectly upright and produces spangled seed heads starting about now. Who am I (smack self in forehead) to be telling you about grasses? So ... are you implying that you like grasses? Huh, that never would have occurred to me. Actually, that Shenandoah looks really good. How tall does it get? Hahahahaha...touché! 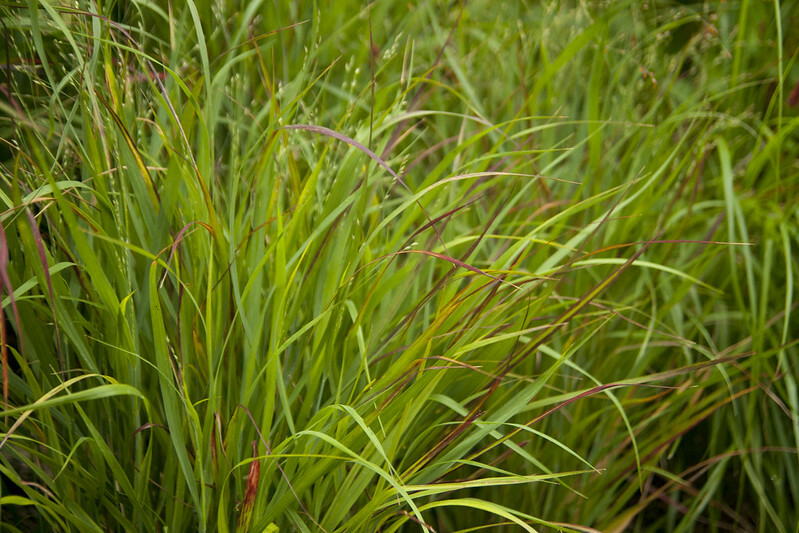 It's a fabulous grass...it does stay fairly short...maybe around 4' tall in bloom. On the dappled willow, I think you should take the gardener to task on this one. 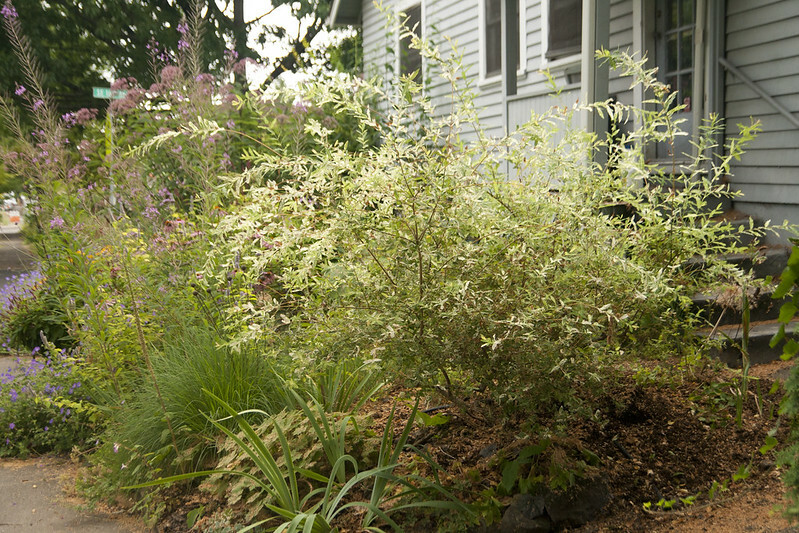 A well-sheared dappled willow is one of the prettiest shrubs there is. I'd immediately shear it down to where the new growth begins and then in 6-8 weeks take it back another 6" or so until you get it to about 2' to 3' in diameter, tops! Oh my...I'm so bad at pruning! I'll take a look...maybe I'll give it another chance! 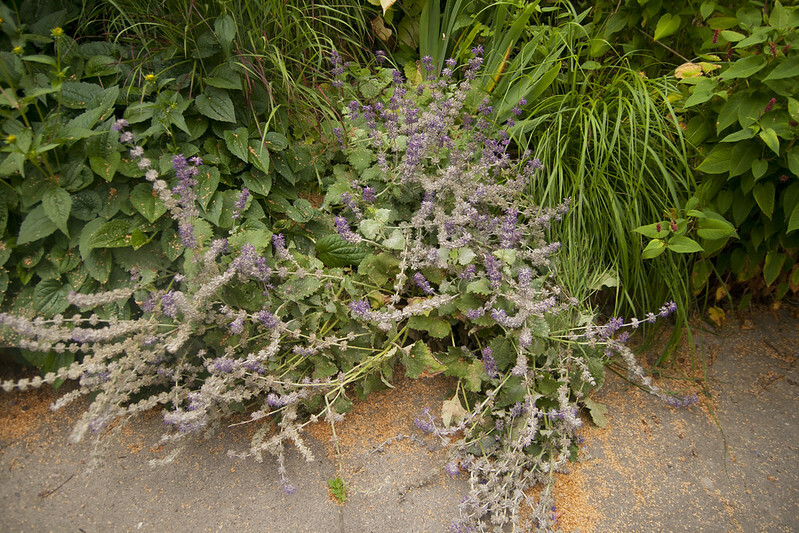 Sorry to hear the Salvia had to go; I do have quite a soft spot for Salvia, but anything that gets mildew just has to go. So I can understand your decision, plus the grass is gorgeous! Your garden looks amazing as always, perhaps one day mine will be as amazing. I know how you feel...it broke my heart a bit to have to get rid of it...but I did give it 3 years to get its act together! Your garden already looks amazing! I'm with Rachelle, trimming it back might give you (and it) a different outlook. We're looking at replacing some ugly junipers with some Ninebark - Center Glow, I'm not sure if Ninebark are agreeable in your zone, but I enjoy 'em. I absolutely love Ninebark...sadly, I think that space is too small for one :-( Good luck removing your Junipers...those 'Center Glow' are going to look a million times better! Ya I have to agree that was a change for the better. I think I might have actually gasped when you showed the close up picture! Can't wait to see what you do with the willow spot. Of course I want to encourage something completely random (like a Tetrapanax) but I know you'll think of the perfect something. Your garden is looking super. I love the mixed border style you've hit on with a nice variety. Great balance between horizontal growers and vertical counterpoints. Those prices were a steal. I would have been just as excited. Thanks, David, so glad you like it...and yes, I CANNOT pass up a good bargain! Hey Scott: I didn't read all the other comments, but to avoid the flopping and probably the mildew you can deadhead all the Salvia blooms right after they fade a bit. I do that several times each summer, and the plants rebloom in waves. I've never had powdery mildew on Salvia--I'm thinking maybe the deadheading helps. Of course, if you're simply sick of the plant, this advice isn't helpful. 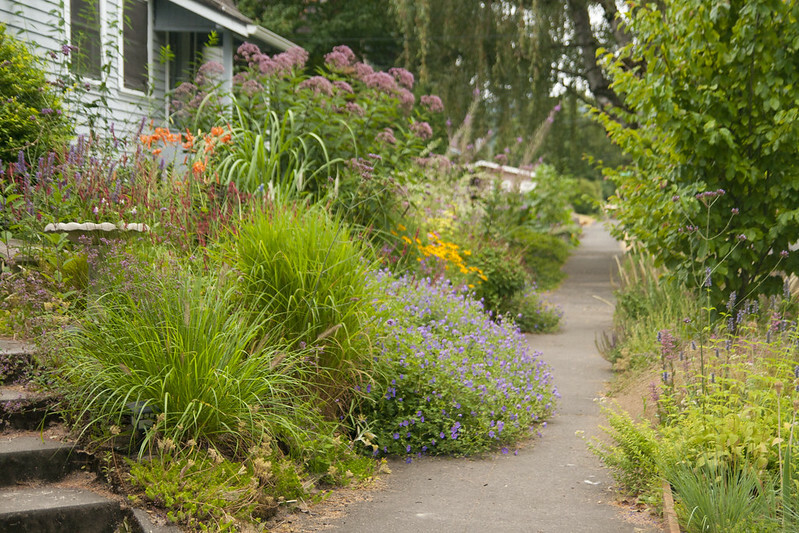 But if you ever want to try it again, try the deadheading and you'll be rewarded. Plus, the butterflies and bees love them! I had Purple Rain for a few years, no mildew but the flopping was just a major annoyance, so mine went bye-bye too. Lovely willow ! You said 'move' instead of re-move so I infer it will get a new home. So how about really going for the drama and install a nice patch of Lobelia tupa ? Is it hardy for you ? I'm actually going to give the willow to another, more-deserving gardener...who has a MUCH bigger garden! I hadn't even thought about Lobelia tupa...that would be fabulous, wouldn't it! I'm a big ' Shenendoah ' fan , I have. one that ist twice as big and tall as the others, it sit under the rain chain and gets all the sun . I love them so much...and yours always looks gorgeous...I'm jealous of just how colorful yours get! Don't believe I've seen the view down the sidewalk look so lush. I think it's about time for a new moniker out there: The Heaven Strip. What do you think? Hahaha...I love it...maybe I can get that trademarked! Hi Scott, You are heartless, such a good salvia! No! I'm joking, if a plant doesn't perform it has to go, that's my motto too. Reading the comments above I saw that you don't have rain for three months, about the same as here. You have a lot more flowers than I do so I'm imagining that you either don't get such high temperatures or that you irrigate a lot. I'd be really interested in knowing how much, how often. I know...I was sad to get rid of them...but, you never know, maybe in my next garden, right ;-) I love the idea of Penstemon...they are definitely in the running! 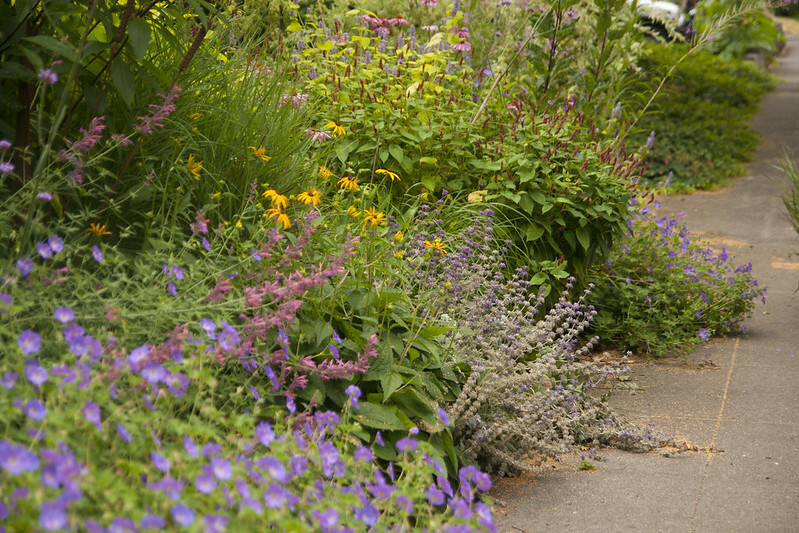 I love the fullness of the plantings. It is exactly what I want in a garden. Beautiful. That sage is a new one on me,I wonder how it would take Texas heat. Normally I would say they would do well...but they seemed finicky for me...but I think it's worth a try...they are gorgeous when they are happy! Nice riot of color and texture, even without the occasional sculpture plant:-) Interesting on mildew's onset and change to full sun - would have guess that would happen in more shade. I especially like when you speak of "always something that doesn't perform". I'm thrilled that "always, something manages to perform!" Hahahaha...yes...there isn't much sculptural stuff happening, I'm afraid, David ;-) Hahaha...too funny, but yes, I'm a stickler...a plant has to look good for MOST of the year...I'll accept some sloppiness in winter and early spring...but I like good, structural plants! Yep, that Salvia becomes a dog. I had it for years and finally removed it two summers ago. Seems like it would be a nice plant and blooms really well but without the right conditions it becomes a floppy, mildewed mess. Love the panicum! perfect replacement. Thanks, Deanne, I'm glad it's not just me! As Gilda Radner used to say in the olden days of SNL, "It's always something...". Still, every failure, no matter how disappointing, also provides an opportunity. It looks as though you're making the most of yours. 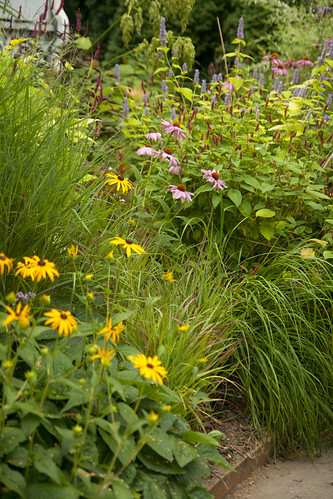 Your gardens just make me want to linger long and take in the breathless beauty....I love the grass you chose....I have lots of work to replace plants that have not performed as they should...but it is worth the time. I love native small trees and bushes with fruit for the birds so that would be my choice for replacing the willow. 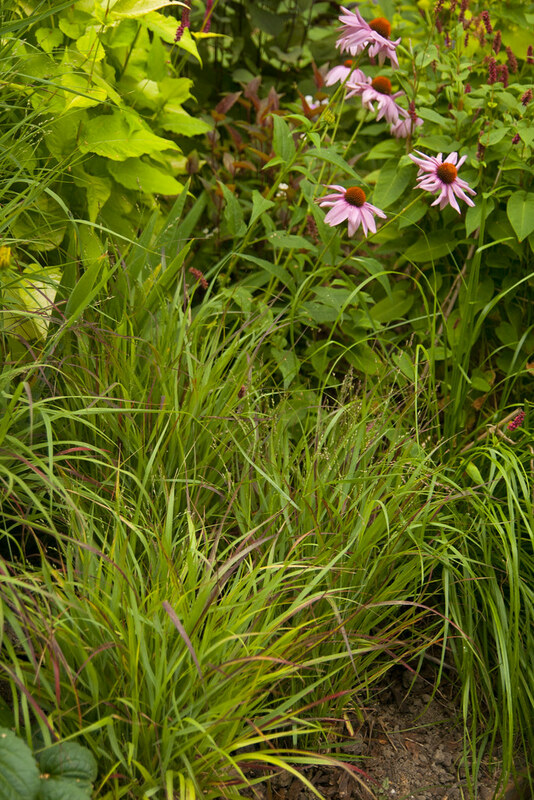 So nice to come to your blog and see the Panicum 'Shenandoah' after you recommended it to me. I'm loving it more every time I see it, although I have a feeling it would be far less beautiful in my garden than it is in yours. That's because, unlike you, I am the kind who leaves floppy sages with powdery mildew. It's so hard to part with a plant - any plant.